Just below your carpets may lie hidden hardwood beauty, patiently waiting. Professionally refinishing hardwood floors can bring that beauty back to life. If you have existing hardwood floors that look tired and worn, it’s always possible to refinish or resurface your hardwood floors, restoring them to their original color and beauty. Many older homes here in the Reno/Tahoe area have hardwood floors which have had carpet over them for 40 years or more. That carpeting, no matter how new or “stain free,” will grind dust, dirt, and sand into the face of your hardwood floors continually. What most people don’t know, however, is how hardwood floor refinishing, professionally done, can turn even the most abused hardwood floors into works of art. Stains, Uneven Coloring, High Traffic Wear, Scuffs, Gouges, Scratches… No Problem! Old, beat up hardwood floors can be turned into rich masterpieces, which demonstrably increase the value of your properties. There is nothing cosmetic in your hardwood floors which our trained, professional staff cannot return to beautiful, for less time and investment than you might ever believe. Stains Marring Your Hardwood Floors? Hardwood floor stains can be difficult to remove, particularly if you’ve inherited them from the previous owners. “New Carpeting!” can indicate that the old owners didn’t want you to see how much age and wear those floors had experienced. Fortunately, my team is capable of removing stains and refinishing your hardwood floors so that the beauty, color and shine are returned throughout every room in your property. Walkways and High Traffic Areas All Worn Down? Wear patterns will appear on your floors along the hallway, at room entrances, and in front of perfectly placed furniture. Sofas, entertainment centers, hutches and the like will sometimes only fit in the one “best” spot. Returning those areas to their original beauty is one of my favorite parts of the job. One of the most common culprits are throw rugs, which cause discoloration in your hardwood floors because of a lack of light. Most often, we can bring your floors back into an even coloration all across the board. Depending of course on the level of damage done. 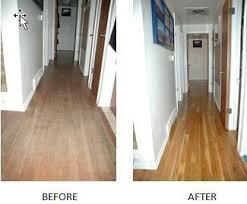 Hardwood floor refinishing here in the Reno/Tahoe area is as much an art, as it is a science. And it’s worth mentioning that not all problems are simply cosmetic. I would love the opportunity to come see your floors myself, to give you the best professional advice possible on how to bring them back to their original beauty and value. Do please contact me at your earliest convenience. Consultation are always free, and I love making new friends. Allow me to show you how fast and affordable a refinishing can be.